The idea of a Ghanaian-run car company offering Ghanaian-built, Ghanaian-designed world-class cars and trucks is compelling. Unfortunately, the reason Kantanka Cars is able to offer world-class vehicles is simple: It gets just about everything shipped over from a Chinese automaker. The Kantanka vehicles supposedly designed for Ghana’s local conditions are, in fact, indistinguishable from ones that have been on sale in China for years. Kantanka’s CEO has admitted to working with a secret Chinese partner, and one Chinese company has already claimed responsibility for Kantanka’s entire factory operation. To the extent that the cars are produced in Ghana, it appears to be matter of final local assembly of components that have been stamped out and largely prebuilt in China. It would seem Kantanka’s unique contributions amount to little more than the badges and trim, a fact that has escaped news coverage to date. As evidence of Ghana’s ability to compete with the rest of the world at a high technological and industrial level, Kantanka appears to fall far short. As testimony to Safo’s longtime ability to create works of faith, though, the company makes a remarkable story. Though it has a stable democratic government and somewhat strong oil, gold, and cocoa exports, economic news out of Ghana seems more defined by big promises and false starts than anything else. In 2011, Ghana was declared the world’s fastest-growing economy, but that statistics game quickly fizzled out, much like new (increasingly Chinese-run) steel mills and auto manufacturing plants that never make it past their pre-launch promises. It’s just that none of these announced projects have been as big, as dramatic, or as well-received as Kantanka, and that’s perplexing, as every major media outlet has gotten its story wrong. A church with business connections is not altogether uncommon in Africa. It’s just that nothing has ever been this technologically advanced, or sought this scale of production. Safo started his own church, Kristo Safo, in Ghana back in the ’70s and made his money first by producing and selling low-cost soap. How he got his doctor title, or when he started calling himself an apostle, are less than clear. Those are two of the few things I haven’t been able to figure out, even after reading an overload of rarely skeptical, fawning, possibly self-published, sometimes academic, sometimes difficult to believe profiles of the man. “Pentecostals are hugely involved in business all over Africa—both the church as business, and business that has occult overtones.” Dr. Jean Comaroff, a professor of African and African American Studies and of Anthropology at Harvard, explained to me over the phone, noting that the Nigerian film industry, Nollywood, is almost entirely run by Pentecostals. “But this case does sound quite arcane,” Comaroff said. Arcane is a good way to describe Safo’s inventions. At his annual tech fairs, held every year since 1980, he has unveiled a series of remarkable products to the world: a brick-making machine, for instance, or an electric guitar shaped like a fish. And as his church has grown—it now supposedly has some 130 congregations—his inventions have become increasingly elaborate, up to and including an array of robots. Some robots were supposed to act like security guards or farm workers. Another rode a tricycle. One was designed to function as a three-in-one sweeper, mobile billboard, and rocket launcher. Nearly all of them are listed and photographed here. A progression of Safo’s products. From left to right, a block moulding machine, consumer electronics, the 3-in-1 robot, a security robot, a tank. Safo’s helicopter, to give context to Kantanka’s claims regarding the state of their production capability. Image via Africa Arm Magazine. Those are “rocket launchers,” according to Safo. Yes, they are held on with tape. No, this helicopter has never made it off the ground. At the tech fairs, he hands out free food and demonstrates his walking, talking inventions to happy crowds and politicians who go “only to get votes,” Dr. Kodjo Senah, an associate professor in the Department of Sociology at the University of Ghana, explained to me over the phone. Safo’s early designs, like his block-making machine, were easy, Senah pointed out. The later technology, like the helicopter or the robots, “is beyond my belief, too,” he said. I had initially emailed Senah asking what ordinary Ghanaians think of Safo. The robots and the rest looked so unpersuasive, I didn’t know if I was missing something. He spoke to his students and to other people he knew, all of whom were very skeptical, if somewhat hopeful that it might all work out. For all the decades Safo has shown his cobbled-together inventions, he has been little more than ridiculed in the foreign press, uncritically backed in the local press, and given little from any government or bank than a smile, Senah said. And now, all of a sudden, he has emerged with a polished, fully realized line of automobiles. “This is very puzzling for all of us,” he said. There’s no other kind of technology that gets more tied to a national identity than a car, and that’s exactly how Safo framed his first notable automotive effort. “We want to show the world the intellect of the African,” Safo said in a mini-documentary, possibly commissioned by Safo himself, following him and his apprentices as they assembled their first SUV. They constructed it almost by hand. Handcrafting old-looking cars was all Kantanka could do just a few short years ago. What Kantanka says they’re making now is a world apart from this early effort, literally and metaphorically. Believe it or not, this was recorded not in the ’80s or ’90s, but in 2006. The SUV itself looks like a knockoff of an early 1990s Isuzu Trooper and the assembly is done almost completely by hand. Panels are hammered on the floor, the engine block is cast in a courtyard, and trim pieces are made off of whittled molds. This is not to say that you can’t find new cars, even from major manufacturers, being sold in Africa that look like they came out of the ’90s. Renault, for instance, builds and sells new Dacias in North Africa with some success and they’re based off of a hatchback Renault started selling well over a decade ago. But handcrafting old-looking cars was all Kantanka could do just a few short years ago. What Kantanka says they’re making now is a world apart from this early effort, literally and metaphorically. None of these vehicles have made it out of Kantanka’s headquarters, let along into consumer production. And then, just two years after he was still hand-making that limo, Safo announced he was constructing a modern factory, one producing cars at a rate of 120 vehicles a month. 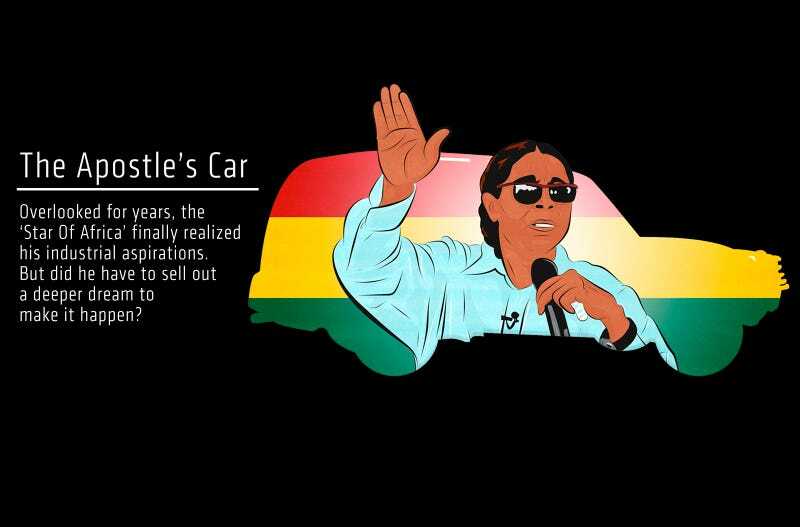 His son Kwadwo Safo Jr. became the new face and boss of the business, and Kantanka started showing off cars and trucks that didn’t look like they were hammered together in a shed. Safo’s dream seemed to have been realized. By 2015, Kantanka was making global headlines with reports on the BBC, Forbes, Al Jazeera, and CNN admiringly showing made-in-Ghana cars. They were “built to survive anything,” CNN gushed. It was around this time that Kantanka put out some pictures of their assembly line, including this one that has a guy sitting on the equipment. It was as if Kantanka’s cars had leapfrogged the company’s own operations. “We have made quite significant sales, including a very important one to the office of the president,” Safo Jr. told CNN just last week, claiming to get the recognition from the government his father (or his sister recently elected to the Ghanaian parliament) could never secure. There was no way it could be real, I thought, up until I went to the linked URL of the mysteriously-named Chongqing Big Science & Technology. But there was the evidence that Kantanka’s new Ghanaian cars were actually coming from China. I’ll put the cars side by side so you can see exactly what I mean. The Kantanka brochure images are on the left, and the Chinese brochure images are on the right. The only differences visible are the badges. The Kantanka Onantefo SUV (approx. $24,700 USD) matches the Foday Explorer 6, built off of an old Mitsubishi frame since 2010. The Kantanka Omana pickup (approx. $22,600 USD) appears to be the Foday Lion. Even the little new Kantanka K71 hatchback (approx. $19,700 USD) is a dead ringer for the Brilliance Jinbei S30. As I started looking further into Chongqing Big Science & Technology’s page on Alibaba—the massive Chinese e-commerce marketplace—I noticed that the site not only offered the same cars as Kantanka, but Chongqing Big Science & Technology explained that they sell the production facilities to assemble these vehicles yourself. And they will send out trained technicians to help you learn how to assemble these made-in-China cars, kind of like the world’s most complicated Ikea sets. To prove that they offered these services, Chongqing Big Science & Technology advertised that they had done this work before. In Africa. With pictures of the company’s workers in Ghana, building the factory that Kantanka proudly showed to the press as its own independent work. “Located in Accra, Ghana, KANTANKA AUTO was founded in 2012 by KOSA group (Ghana) and BIG S&T group (China) to bring innovative auto technology to Ghana,” Chongqing Big Science & Technology advertises on their Globalized Operations page, later generously claiming that Kantanka’s production is 200 vehicles per month. The timestamps on the photos show that they started shipping over Chinese parts to Ghana at the same time that Safo started to announce his new production capacity. That truck that Kantanka claimed could be started with a cane? It’s identical to the white one on the middle right. By all appearances, Chongqing Big Science & Technology is the secret behind Kantanka’s rapid transformation from a producer of low-level oddities to what looks like a viable auto manufacturer. Certainly it was strange that an Alibaba page, basically China’s version of Amazon where you might buy generic backpacks or electronics in bulk, might be the key to one of the breakout stars in the automotive world. But it’s not all that odd for a company in a developing nation to sell cars assembled from parts built in more industrialized countries. In the auto industry they’re called Complete Knock Down kits (CKDs), or KDs more generally. CKDs are basically how auto manufacturing got its start in India and in Iran. Daimler also notably used CKDs here in the U.S. to skirt American import tariffs on their big vans, and even Lincoln bizarrely shipped Town Cars to China as CKDs for local assembly as Hongqis, the brand of car that China’s president rides around in. The way it all works is that a developed country that has things like stamping machines and welding robots does the heavy industrial lifting, then ships those semi-finished pieces to a country that doesn’t yet have much in the way of advanced tooling or skilled labor does the final assembly. What varies is how much assembly has to be done on a local level. Judging by Kantanka’s factory tours, showing complete rolling chassis, engines hooked up and all, it appears to be using very complete kits from China. There’s no way that Kantanka could be doing much more; one German news team found that the factory is designed to be able to operate without electricity, and as late as August 2015, work was still being done by hand. A screenshot of Ghanaian TV’s eBusiness Journal’s tour of the Kantanka factory showing an assembled rolling chassis. It’s also not odd for a Chinese company to get involved in an African operation. Chinese investment in Africa has a short but very intense business history, and that does include the automotive sector. Chinese cars started making their way onto African shores in the early 2000s and now they dominate many domestic markets on the continent, as GoodCarBadCar reports. There are Chinese joint ventures in Mozambique and Ethiopia assembling what are openly recognized as Chinese vehicles. But selling these cars instead as locally-assembled “Made In Ghana” Kantankas not only would give them good press, it would skirt Ghana’s import laws and let them sell at low price. Once I had read through everything I could find about Chongqing Big Science & Technology, I thought I had the whole Kantanka story cleared up. But it’s hard to believe that Chongqing Big Science & Technology is solely responsible for Kantanka’s growth. After all, they exist as a collection of Alibaba listings. They claim to have been around since 2004, with “51-100" employees, but there’s little to go on but for a few generic factory photos. There is, however, is a genuine automotive manufacturer that produces these cars: Guangdong Foday Automobile Co.,Ltd, which also advertises similar knock-down kit sales services, even on Medium of all places. Both are based out of the same region of China. So it might be Foday Auto that’s involved and not Chongqing Big Science & Technology. But Foday itself is not a large company, as Car News China reported all the way back in 2010. Foday claims their annual production is 100,000 completed vehicles per year with another 300,000 in kit form, but I struggle to find any evidence the company has been operating at all since their last ‘new’ vehicle launch halfway through last year. Moreover, their own website recently went offline. Kwadwo Safo himself reportedly tried and failed to get outside investment from India or China for years, so in a way this is the realization of a longtime dream for Kantanka. But Kantanka’s secret foreign partner may be taking advantage in the relationship. What can look like investment doesn’t actually bring money into a developing nation, but instead draws it out. If a Chongqing Big Science & Technology or Foday or whoever wanted to sell a Chinese truck in Ghana, they’d face a steep price hike. Selling these cars instead as locally-assembled “Made In Ghana” Kantankas not only could give them good press, it would skirt Ghana’s import laws and let them sell at low price. Basically, whatever Chinese company is behind all of this might just be using Kantanka to get access to cheap local labor and dodge import fees. This is exactly what’s been going on in the mining industry in Ghana and across Africa. I reached out to Dr. Lauren Coyle at Princeton’s anthropology department, who studied the ever-growing role of China in Ghana’s mining sector. She explained that “the Chinese are not allowed to get licenses for small-scale mining concessions, so they had been making arrangements with some Ghanaians to front for them. (Only Ghanaian nationals can get them. )” The very same could be happening with Kantanka. It’s an issue referred to as “wealth extraction”: what can look like investment doesn’t actually bring money into a developing nation, but instead draws it out. Only a handful of Ghanaian news sources have pointed out that Kantanka has any kind of Chinese partnership at all, but each of these outlets state that Kantanka is only getting parts from abroad, not knock-down kits. In an interview with local eBusiness Journal, Safo Jr. volunteered that he does have a Chinese business partner, but that he would not name what it is, or how involved the relationship is. That this Chinese relationship is kept obscured goes against Safo’s message of bringing pride to Africa through home-market design and manufacturing. Moreover, it’s difficult to tell if Kantanka has even sold a single car at all. Through all of its news stories, interviews, TV reports, and factory tours, there’s no evidence that any ordinary Ghanaian citizens have a Kantanka car in their driveway. News stories in 2016 are still using two-year-old photos of completed cars. It’s hard to tell how many cars Kantanka has actually produced, particularly because we almost never see any vehicles outside of Kantanka’s factory. The only times these things are recorded beyond Kantanka property, they’re organized in some Kantanka photo shoot or being driven by a celebrity or government official. We don’t know if any of these “owners” actually purchased their cars, or if they were gifted them by Kantanka as part of some publicity stunt. Worse still, Kantanka is perpetually claiming that it’s about to start production. As late as November last year, commercial production was one day away, whereas in 2014 it was one month away, but I could find no evidence any cars have actually gone to individual consumers. Kantanka has claimed that they can build 100 vehicles a month (you’ll remember it was 120 earlier), and they claim to have delivered several vehicles already, but those cars have only gone to government officials and departments. Kantanka’s business relationship with their unnamed Chinese partner has been going on since at least the start of 2014 and still we haven’t seen a single car make it into private hands. Perhaps the biggest mystery is how Safo made so many media outlets believe him.